Stately Babydoll Manor | Oh, The Glamourous Life! 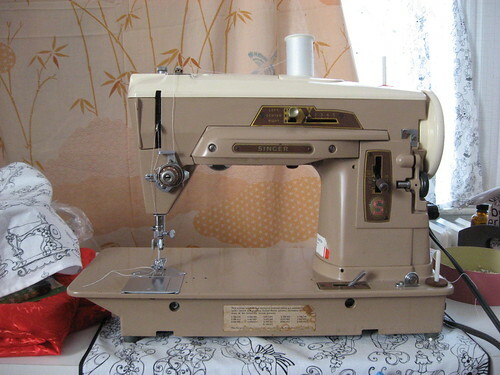 Yesterday you saw my sewing room and there in my sewing machine. My friend Lucianus got very excited about my vintage machine, having one much like it, so I thought I’d share a little more about it. 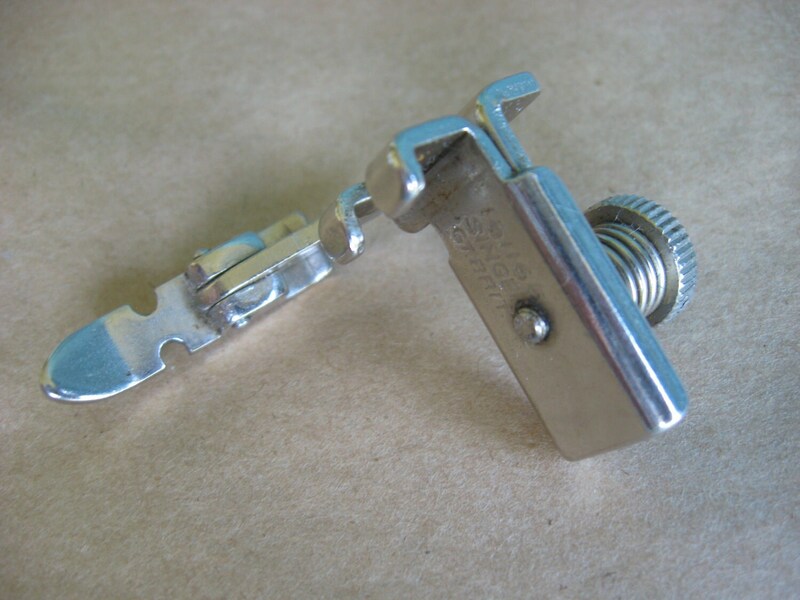 This little delight contains all sorts of goodies, like the feet: general purpose foot, straight stitch foot, seam guide, zipper foot, hemming foot, button sewing foot, multi-slotted binder, and ruffler. 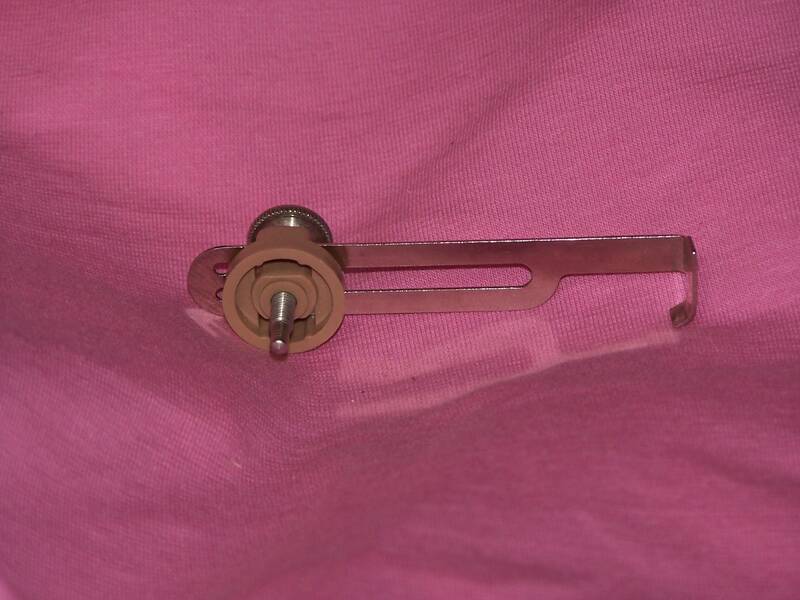 It also contains the “fashion disks“. 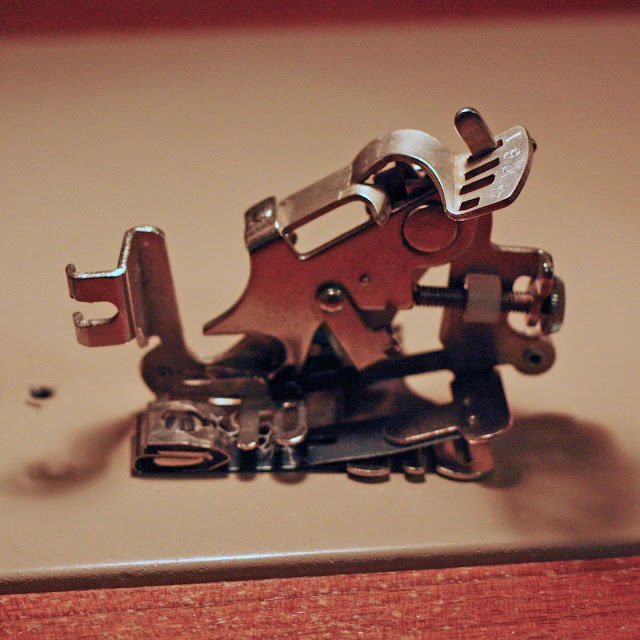 These are cams you drop in the top of the machine to make fancy stitches. 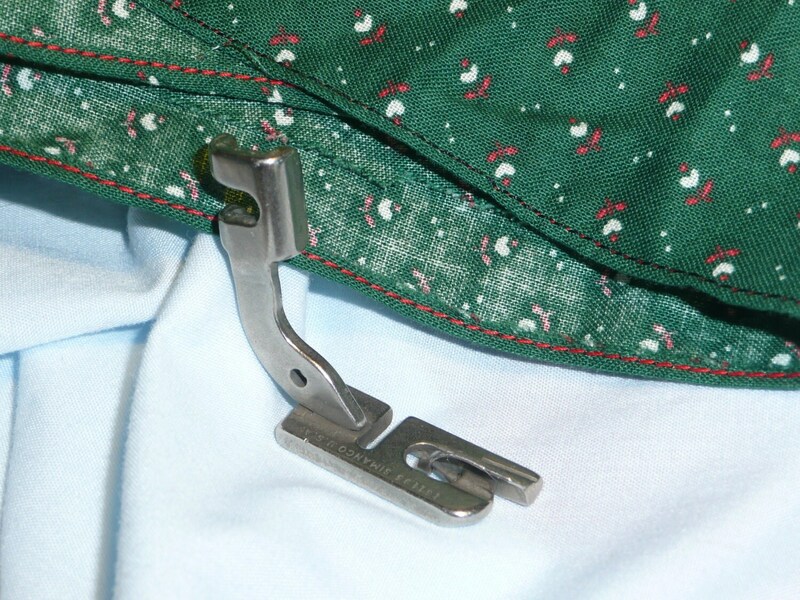 Without any, you can only straight stitch. I always have #0 in place, for basic zigzag. I’ll be honest –I’ve never used any other the others. It was only last night that I realized that I had all the original disks, less #9. One wayward part after 55 years — not too bad. 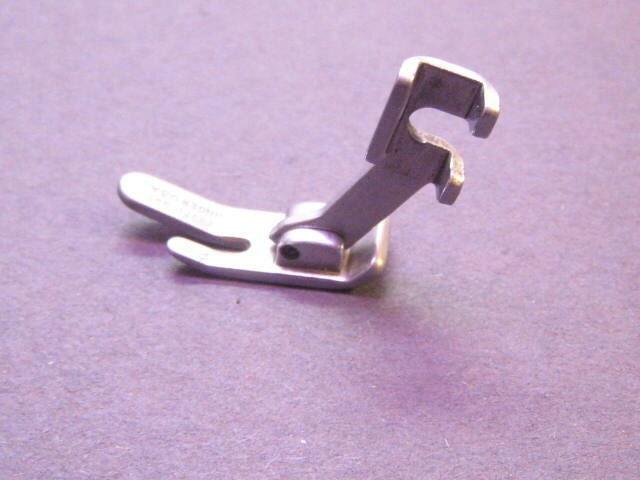 As I mentioned, the one thing I don’t love about this machine is making buttonholes. It’s a complicated process involving repeatedly changing the needle position and the stitch length. I’ve never been able to successfully make nice buttonholes. It’s easier to make them by hand. 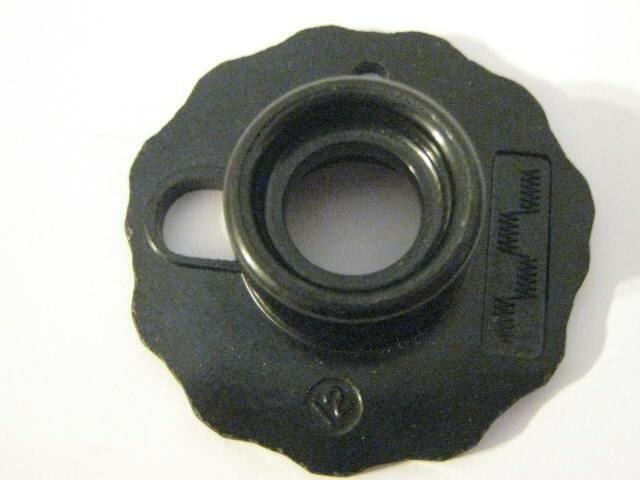 Lucianus opened my eyes to the fact that there a buttonholer for my machine! And someone was selling a complete set on eBay. Needless to say I jumped at the opportunity. I’ll let you know how it works out. This is where is all happens. Well, all the costuming anyway. 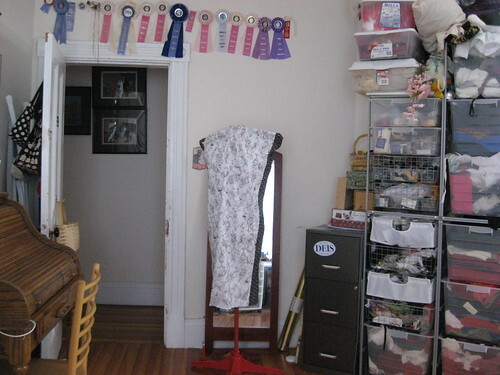 My sewing room at Stately Babydoll Manor. Here we are facing the door. You can see my dress form with its snazzy cover, made from fabric printed with whimsical dress forms. Behind it is a rather nice mirror Scratch found for a makeup class at the Expo and I inherited. The filing cabinet holds my patterns. You can just see the ironing board behind the door and my mail basket on the door (I only mention that because I made the basket). Above the door are ribbons from costume competitions. To the right of the door is my fabric and trim stash. It’s a little out of control. 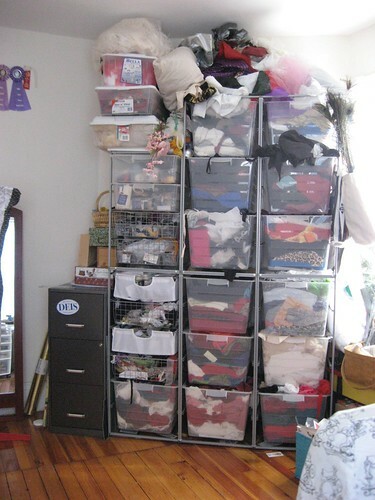 The bins are actually well-organized; I just need to get rid of/use up a bunch. The plastic containers way up top hold feathers, boas, and small fans. Just off to the right is a wooden bench (you can see a bit of yellow) I made in Scratch’s wood shop, under his direction. It currently serves more as a repository of stuff than a windowseat, which was my plan. Sadly, you can’t see the large basket on feet which I also made. During a project it holds important stuff so they don’t get lost in the chaos. 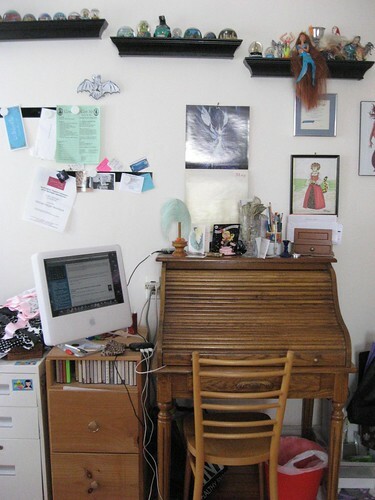 To the left of the door is the office part — roll-top desk, computer, filing cabinets. This is where the business part of B.A.B.E. happens. One of the filing cabinets is currently heaped with cocktail and tea aprons looking for a place to live. One of those decorative shelves is filled with mermaids. The other two have my snow globe collection. I’m very particular about my snow globes. They should be the cheap tourist kind, contain an iconic landmark or city scape, contain snow (as opposed to glitter), and be from somewhere where it doesn’t usually snow. Thanks to globe trotting friends, I have snow on the Alamo (that’s was my first! ), snow on the Great Pyramid, snow on the Las Vegas Strip, snow on the Alhambra, snow on the corner of Hollywood and Vine, snow on Masada (my favorite), snow inside Penn’s Cave, and several more. Opposite the door is my actual work station. 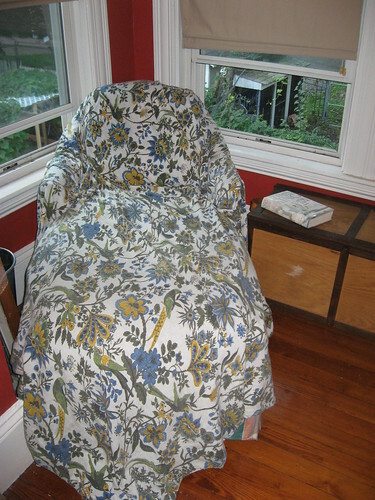 My sewing machine itself is under that sewing machine cozy, printed with whimsical sewing machines. One of the bookcases has all my sewing & fashion books (as well as Elizabethan and maritime history books. I’m eclectic in my interests). 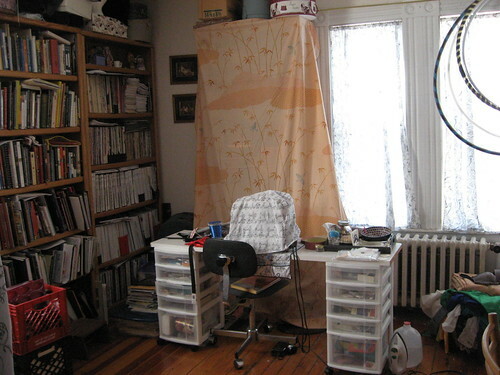 The other one is mostly magazines, mostly sewing or needlework related. The one dead ahead has a lot of crafting supplies. It’s not attractive, so I draped it with a pretty bedsheet. On top of all the bookcases are hats and hat boxes. I’m sorry it was sunny out, partially because it messed with my camera, leaving this picture dark, but really because you can’t see my clever curtains with sewing related prints: dress forms one one, scissors on the other, and sewing machines on the window above the bench. I keep my hula hoops on the curtain rod above. Why not? 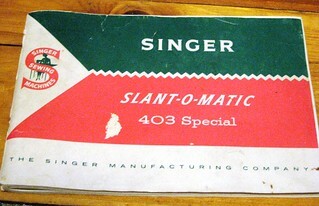 And this is my wonderful 1950s Singer Slant-O-Matic that my mother handed down to me. 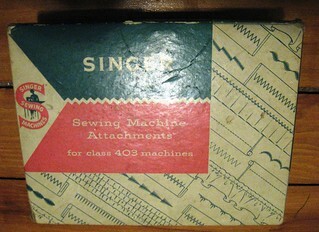 Family lore says that my great-grandmother’s treadle machine was sold to buy this one. I love everything about it except how it makes buttonholes. I’ve considered getting a modern machine just for that. And that’s the grand tour. You’ll be seeing bits of it as I work on the Fit & Flair dress and now you’ll know where those bits are. Happy Mardi Gras! Or Shrove Tuesday! Or Maslenitsa! Or just plain Tuesday! There might be pancakes (or beignets or blini) at stately Babydoll Manor tonight. Any excuse to celebrate! Because I’m feeling festive, here’s Scratch’s recipe for blini. Combine flours, baking powder, and salt in one bowl. In another bowl, whisk milk, egg, and 1 Tablespoon of butter. Whisk wet ingredients into dry ingredients. Heat 1 Tablespoon on the butter in a medium pan and when it’s sizzling, pour the batter into the pan by Tablespoons to make little pancakes. Cook over medium-low heat until the batter starts to bubble, about 2 minutes. Flip and cook for another minute, until brown. Repeat with remaining batter, adding more butter as necessary. Serve with sour cream & caviar. P.S. Scratch reminds me that Maslenitsa isn’t until next month (forgot about the Orthodox calendar) and that these are quick blini; proper ones are made with yeast. * To clarify butter, gently melt the butter. Strain the melted butter through cheesecloth and toss the white solids left behind in the cloth. The clear golden liquid is clarified butter. It heats to a higher temperature and keeps longer than regular butter. I hope you had a lovely New Year’s Eve celebration and 2013 is a wonderful year for you! At Stately Babydoll Manor, Scratch made a sumptuous feast, as is his wont. [EDIT: Scratch points out that I neglected to mention the hors d’oeuvres of artichoke tapenade on rounds of Persian cucumber and broiled shrimp wrapped in bacon. Albert, the Manor cat, received a single plain boiled shrimp, but he turned up his nose in favor of cat food. He’s weird.] The main course included a pork roast braised in cider with pears and quinoa mixed with sweet spiced wild rice. But the highlight was a ratatouille galette. Scratch took slices of zucchini, tomato, and onion, and alternated them in concentric rings in a cast iron frying pan that had been lightly coated with basil-infused olive oil. He sprinkled more onions on top and seasoned it (I know dill was involved and seasoned salt. but I’m unsure of the details). It baked for about an hour and everything caramelized. I wish I’d taken a picture, but your Faithful Correspondent is not in the habit of photographing her dinner. That may change this year. You’ll just have to take my word for it that the dish was beautiful and delicious. Also, beautiful and delicious (and similarly undocumented for posterity) was the dessert I made: blackberry clafouti1. Clafouti is a sort of fruity custardy baked pancake. And it’s so easy to make — just put the fruit in a pie pan, pour the batter over it, and bake until it puffs up and turns brown around the edges. In early July I make it with sour cherries from the Manor’s orchards. As a bonus, the recipe I use is quite light & healthy, despite it being for a French dessert. At midnght there was peach prosecco, as there should be. New Year’s Day was spent working on my new costume for The Bod of Avon, which you should all come see, either in previews or the real thing. No photos of the costume, although I desperately want to show you — the fabric is just stunning. Come to the show and see it! And how did you spend the holiday? 1Technically, clafouti is made with cherries and if any other kind of fruit is used, it’s called flaugnarde, but I’m not that much of a stickler for accuracy. I love to read. I think that’s probably obvious. I’ll read anywhere — in the car, at the dinner table, in bed, in the bathtub, walking down the street, &c. I confess that at least once I tried to read in the shower (The Cider House Rules while vacationing on Nantucket). This is my favorite reading spot in Stately Babydoll Manor: the chaise in one corner of the Library. The breeze from the windows is wonderful on these muggy days and there’s lots of light. The chaise has occasionally been seen on stage: in The Wrathskellar, Unlucky in Love, and Tempest Storm’s Las Vegas Burlesque Revue (used by both Betty & Kitten De Ville). Under that Indian bedspread is a plushy sheepskin that’s just lovely to recline upon, but it’s black and the Manor’s resident cat is white and very fluffy. Hence the washable cover. Next to the chaise is an oak chest that Scratch built (I think without a single nail). It’s holding my current reading. Can you figure what book it is from this tiny picture?